I guess life is just an endless stream of banalities, and much of the internet reflects that. It only acquires meaning when you personally connect with that person posting a picture of their cappuccino. My life is as banal, as boring, as everyone else's - possibly even more so. I send the boring pictures on my phone to Peter, to my brothers, my mum, my best friend. Look, this is my life. It's not exciting, but I thought of you. 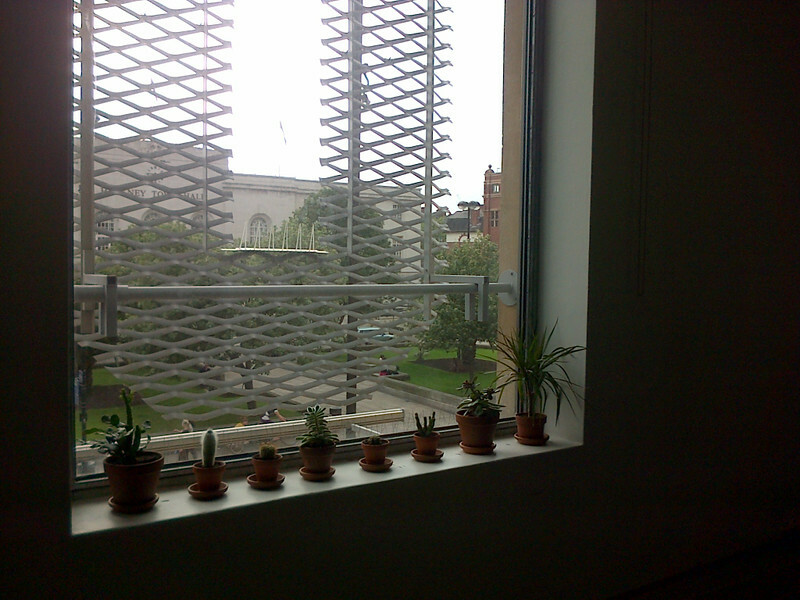 Look, cacti live on the windowsills of the cinema in Hackney. I saw The Two Faces of January, I think you would have liked it, Viggo Mortensen is amazing, isn't he? 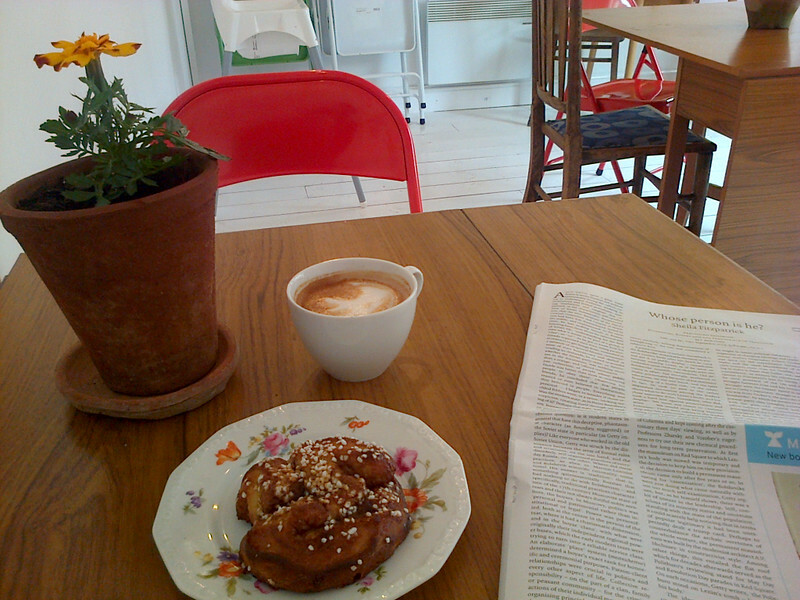 Look, a Swedish café opened not five minutes from where I live, I went there this morning and ate a cinnamon bun, can you imagine how happy that makes me, to have a local café that I love? The LRB had a couple of articles about Marxism, one of them trying to read the Iliad in a Marxist light, I rolled my eyes a lot and thought of how much you'd hate it, the scathing terms with which you'd tear the article apart. 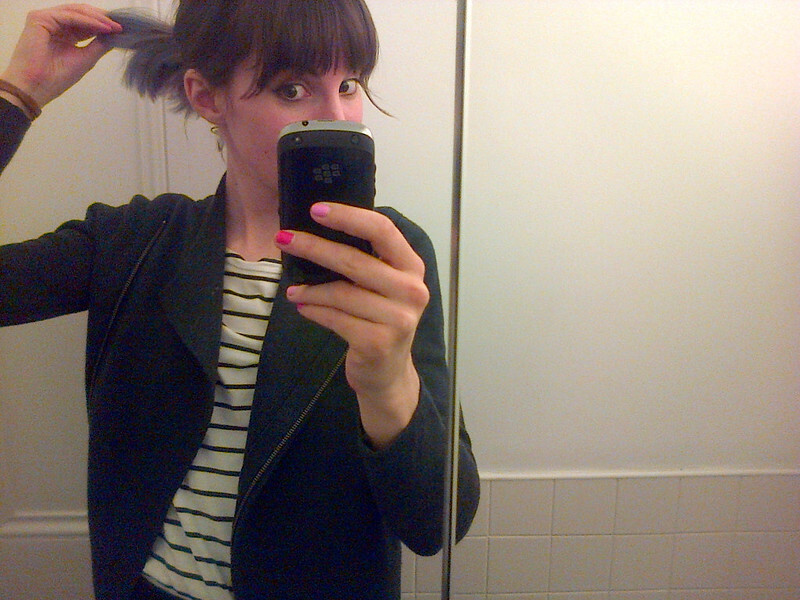 Look, this is my face, my hair, it's blue, lilac, this is what I look like when I make new friends. We went to see The Drowned Man and I wanted to take a selfie for you to show you the mask I was wearing, but I think I'd rather take you to see it yourself. I thought I wouldn't like The Drowned Man, I wasn't sure about immersing myself, but I loved it. Look, this is my reading material for this week, this is a good Sunday. 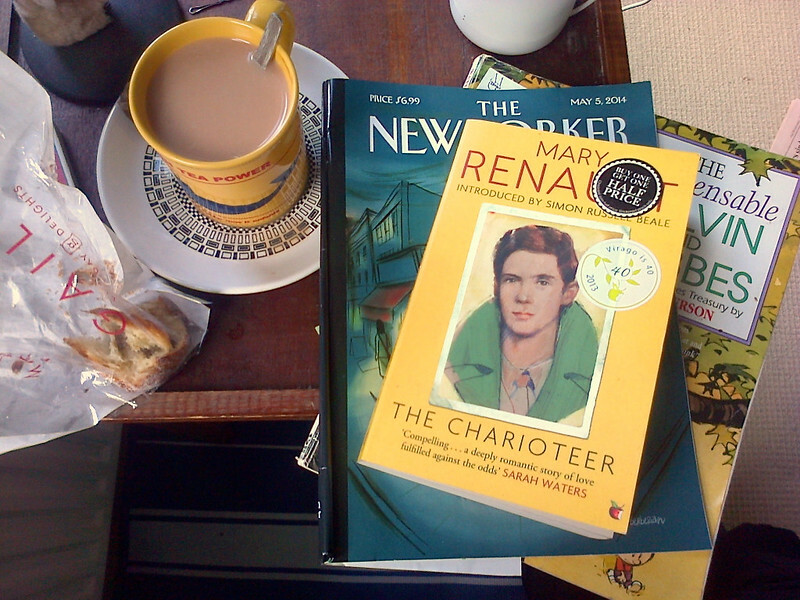 I loved The Charioteer so much, so much that I failed at explaining to my friends why I loved it. As far as I am concerned it's a perfect novel, an extension or counterpart to Iris Murdoch's The Bell (which, as we all know, is my favourite book). The title refers to the Plato myth (souls, horses, etc. ), and when I realised that was the case I sighed a tortured little sigh. Ignore the cover or the blurbs on it, read Rachel Cooke's review in The Guardian instead (which is why I bought it - although I disagree with her that "it sometimes seems overly preoccupied with ethics, with high-minded considerations of how a man might live a good and honourable life" - this is pretty much exactly what I love in a novel, give me all your high-minded considerations of goodness please! Maybe that's why I never warmed to most contemporary fiction.) Read this book. 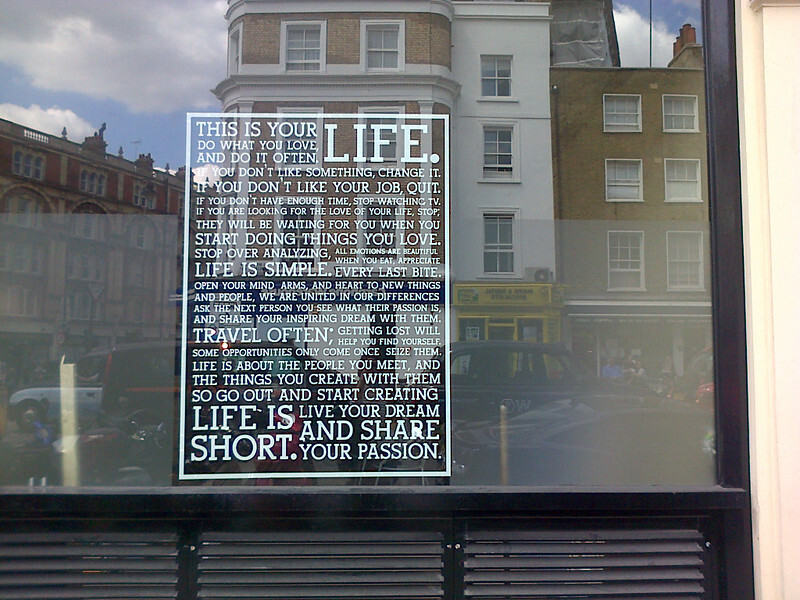 Look, I printed out this poster for you once when you weren't sure about what to do with your life because sometimes simple messages help, even if they're cheesy, even if they feel like hipster self-help, even if they reappear in a shop window in soulless Knightsbridge. Look. I'm not with you, but I'm thinking of you. I've been listening to this wonderful recording of Owen Pallett/Final Fantasy with the Radio Symphony Orchestra Vienna all week, a concert that I attended. It's beautiful, a real treat, and it will make you feel things. I've followed your bolg & flickr since about 2008. The way you portrait your life gives me a comfortable feeling.. Yesterday I've found out that there will be a new Owen Pallett album soon. I listened to this recording too then. Wondered about that he might be one of the very few musicians who always impress me live. A boring life is sometimes the most beautiful. There is a peace to it that some will never understand. The best post you have written so far. I really like your blog!